labor with return of product. The unique part numbering system makes ordering and re-ordering easy and ensures accuracy. 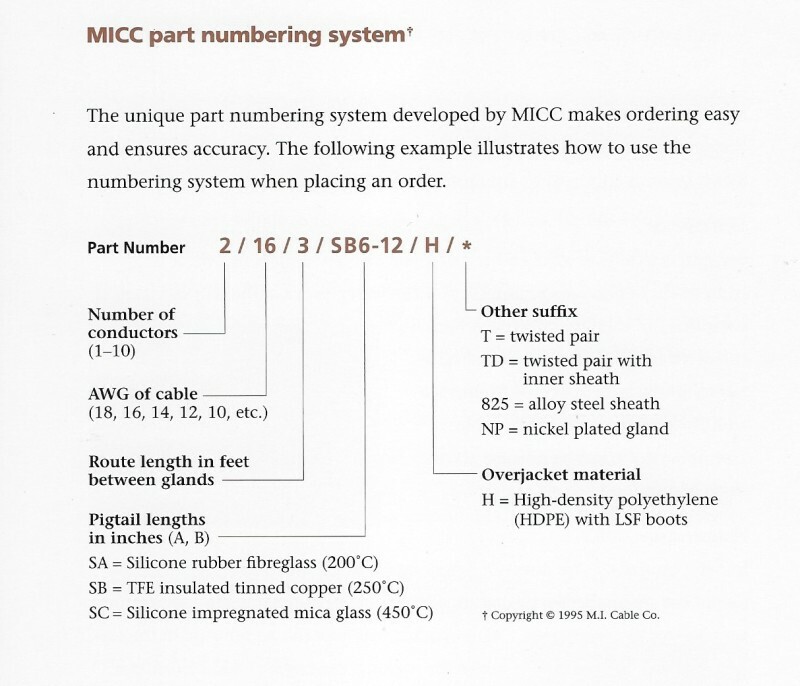 The following example illustrates the make up of the part numbering system and the quotation request allows the make up of individual cable assembly numbers. *Cable reference number = Cable O.D. in thousandths of an inch/number of conductors. **For longer lengths, factory-installed, fire-rated joints are available. Standards for Safety: UL 2225, Cables and cable fittings for use in Hazardous locations. Multi conductor cables for arcing devices and instruments in hazardous locations requiring a gas or liquid block seal. Flexible with drip loop. MI cable assemblies are used in gas analyzer panels, petroleum gas pumping units, air conditioning units and for many other OEM applications where space does not allow bulkier conduit and wiring. Polyolefin jacketed shielded twisted pair cable for digital and milliamp signals is available for corrosive atmospheres. Also available in Alloy 825 for hydrogen and sulfuric areas. Type J, K and T in customized lengths (6mm diam.) as thermocouple extension cables, connect from thermocouple to conduit system. Solid pigtails only, color code according to ANSI/MC96.1-1982. During manufacture all cable assemblies are tested for iinsulation resistance, continuity, color coding and conformity to customer specification. Completed assemblies meet a minimum 100 Megohms resistance between conductors and between conductors and sheath.